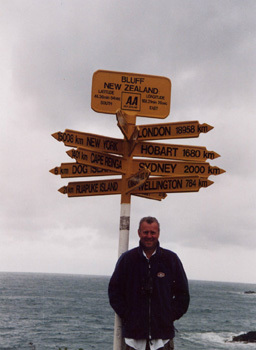 Early in 1998 Amanda and I decided to treat ourselves to a holiday of a lifetime in New Zealand. We had no relatives or friends over there and consequently, once there, we were on our own with lots of sights to see and birds to find. All flights, hire cars and hotels were booked with Hays Travel (formerly St Andrews Travel) from the UK prior to our departure and although with hindsight, we may have stayed in different hotels from time to time, we were generally pleased with the overall arrangements. 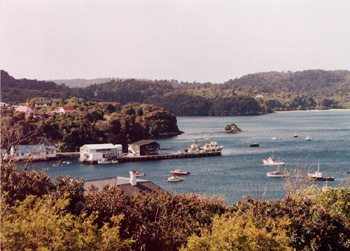 The various ferries and boat trips were arranged locally. We decided to fly with Air New Zealand on a direct flight west via Los Angeles rather than fly east with a stopover in Singapore. We used BA from Manchester to London Heathrow, then left on flight NZ1 at 14.25 on Saturday 21st November, arriving in Auckland at 05.20 on Monday 23rd November after a 2 hour stop at LAX. Flight times and dates don't make sense on either leg of the journey as we crossed the date line and adjusted for numerous different time zones. On the way back we went for a stopover in Fiji to relax after our trek around New Zealand, leaving Auckland at 09.40 on flight NZ31 and arriving at Nadi at 12.45 on 13th December. Refreshed after our short stay in a beach front room at the Sonaisali Island Resort, we left Nadi on flight NZ42 at 23.45 on 17th December, arriving in Los Angeles at 13.15 on the same day! After a brief rest in the airport lounge we continued on flight NZ2 which left LAX at 15.30 on 17th December, arriving back in London at 10.05 on the 18th. Allowing for flight delays we were booked on a BA flight back to Manchester at 13.45. As we were on time we were able to change to an earlier flight, leaving at 11.45. With such a long journey in each direction (London to LAX c11 hours and 5442 miles and LAX to Auckland c12 hours 40 minutes and 6508 miles) we chose the comfort of Business Class and with hindsight, felt that this move was well worth the additional cost. 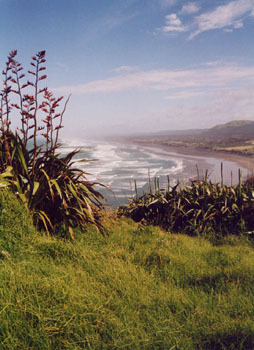 Car hire was via Budget New Zealand. Initial pick-up was at the airport and drop off was arranged for the Wellington Ferry Terminal. A new car was awaiting our arrival at Picton on South Island with drop-off arranged for Dunedin. Both vehicles were comfortable four door saloons. Having chosen our itinerary well in advance we went to a local travel agent and asked them to book us into hotels for all our overnight stays. In reality, with the number of hotels available in all major towns and cities, this move was not really necessary and moreover, without hotels being booked we would have been able to vary our itinerary as we found places we really liked, such as Kaikoura, where we could have quite happily spent more time. All the hotels and motels were comfortable, clean, spacious and good value for money. All rooms had fridges in them, with the majority also having cooking facilities and two large double beds. At the time of our trip it was spring in New Zealand and accordingly the weather was quite variable, especially as we journeyed further south. All in all, we did not see too much rain and enjoyed many sunny days, however the snow as we came out of the Homer Tunnel on our return from Milford Sound was a bit of a surprise. We didn’t take any really cold weather gear with us and were therefore pleased with the fleeces purchased in Te Anau the previous day. The itinerary was worked out with the help of much research into the agendas of the various bird tour companies who cover New Zealand and also Birdwatching in New Zealand by Ian J Burfield. 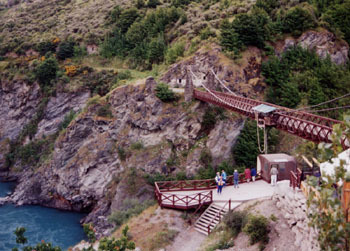 The latter paper, as well as having brief information on all essentials – Getting There, Travelling Around, Accommodation & Food, Climate & Weather etc – has a comprehensive Site Directory for both North and South Island together with maps, a Species Catalogue and a number of useful contact addresses and references. This guide proved quite indispensable at times along with the The Field Guide to the Birds of New Zealand by Barrie Heather and Hugh Robertson – A smaller version of this book is now avialable as The Hand Guide to the Birds of New Zealand. Subsequently a number of other Guide Books (mainly photographic) have also become available such as A Field Guide to the Birds of New Zealand (Princeton Pocket Guides) by Julian Fitter and A Photographic Guide to Birds of New Zealand by Geoff Moon. A much more general guide is the Field Guide to the Wildlife of New Zealand (Field Guides) also by Julian Fitter. Since our trip information has become more freely available via the internet; The Royal Forest and Bird Protection Society of New Zealand has brief information on the main birding sites, along with a wealth of other relevant information. Also New Zealand Birds has a good section dedicated to the main sites. Available since September 2007 but now out of print, a new site guide by Kathy Ombler - Where to Watch Birds in New Zealand - provides information on more than thirty of the country's top birding sites and 2014 saw the publication of Birds of New Zealand - Locality Guide: Where to find birds in New Zealand by Stuart Chambers. Lonely Planet guides to New Zealand and Fiji – were also very helpful. November 23rd Arrive Auckland for 3 nights at First Imperial Hotel 131-139 Hobson Street. Phone 0064(0)93576770. Pick up hire car at Airport. Drove to Whangaparaoa after checking in (c100 kms round trip). November 24th Mangere Sewage Works, Auckland but closed to visitors for last 2 months due to earth moving work. 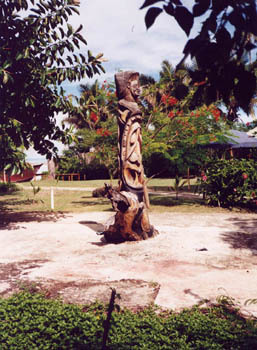 Kaiaua Naturalist Centre, Miranda on the Firth of Thames (c200 kms). November 25th Muriwai Beach ganet colony (c80 kms). November 26th Auckland to Taupo (c280 kms) for two nights at Lakeland Motor Inn, Two Mile Bay, State Highway 1. Phone 0064(0)73783893. Journey via Rotorua with boat trip to Mokoia Island in Lake Rotorua. November 27th Lake Whakmanu & Pureora Forest Park east of Lake Taupo. November 28th Taupo to Wellington (c380 kms) for one night at Angus Inn, corner of Waterloo Road & Cornwall Street, Lower Hutt, Wellington via Tongariro National Park & Orautoha. November 29th Ferry from Wellington across the Cook Strait to Picton on South Island. Hire car left at ferry terminal with new car waiting at Picton. 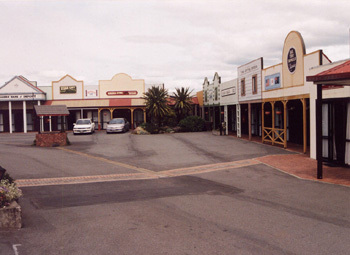 One night at Blenheim Country Lodge Hotel, corner of Alfred & Henry Streets, Blenheim (c29 kms). Phone 0064(0)35785079. 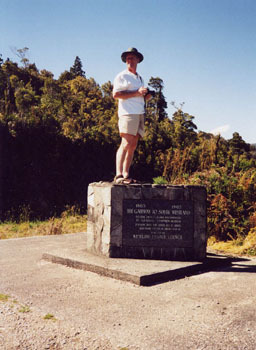 Visited Nelson (c113 kms). 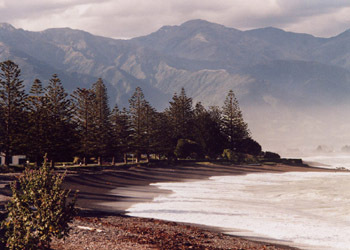 November 30th Blenheim to Kaikoura (c129 kms) for 2 nights at the White Morph Inn, 92-94 Esplanade, Kaikoura. Phone 0064(0)33195014. Explored Kaikoura Peninsula. 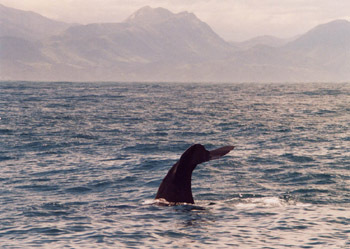 December 1st Whale watching off Kaikoura. Despite rough seas, a leftover from storms 2 days earlier, saw 5 Sperm Whales and several new seabirds in what was a truly memorable experience. December 2nd Kaikoura to Greymouth (c338 kms) for one night at Ashley Hotel, 74 Tasman Street, Greymouth. Phone 0064(0)37685135. Hotel and food not one of our better choices. Travelled via Lewis Pass and Lake Kaniere. December 3rd Greymouth to Lake Moeraki (c300 kms) for one night at Lake Moeraki Wilderness Lodge, Private Bag 772, Hokitika, Phone 0064(0)37500881. 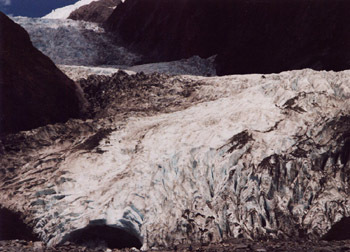 Travelled via Franz Joseph and Fox Glaciers. December 4th Lake Moeraki to Twizel (c307 kms) for one night at Lake Ohau Lodge, North Otago, PO Box 51 Twizel. Phone 0064(0)34389885. Travelled via Haast Pass and Lake Hawea to Lake Ohau. December 5th Twizel to Queenstown (c200 kms) for one night at Goldridge Hotel, Frankton Road, Queenstown. Phone 0064(0)34426500. Started by travelling north to Ohau Power Station on Lake Benmore and subsequently south to Queenstown with hotel overlooking Lake Wakatipu. 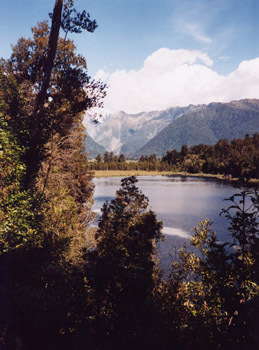 December 6th Queenstown to Te Anau (c186 kms) for two nights at Te Anau Village Inn, Mokoroa Street, Te Anau. Phone 0064(0)32497911. Despite the facades, looking like a wild west town, the rooms are quite normal and very comfortable. Drove out towards Milford Sound as far as Lake Gunn. 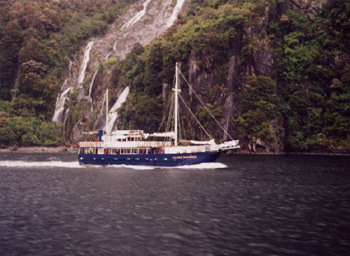 December 7th To Milford Sound (c121 kms) for boat trip, via Homer Tunnel and Lake Gunn, again. December 8th Te Anau to Bluff, Invercargill (c160 kms) for ferry to Stewart Island and two night stay at Stewart Island Lodge, PO Box 5, Halfmoon Bay. Phone 0064(0)32191085. December 9th Superb day on Stewart Island with boat trip to Ulva Island. December 10th Ferry back to Bluff and onwards to Dunedin (c195 kms) for two nights at Southern Cross Hotel, corner Princes Street & High Street. The fire alarm went off in the middle of the night and we ended up out on the street for an hour, dressed in fleeces and very little else. Welcome to the big city! Phone 0064(0)34770752. Visited Papanui Inlet. 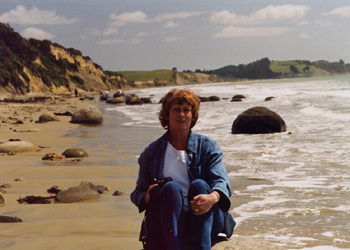 December 11th Trip north to Moeraki beach in morning to look at the extraordinary spherical boulders which look like giant marbles, returning to Dunedin for lunch and onwards to Taiaroa Head on the Otago Peninsula to visit the only mainland breeding colony of albatross in the world (c170 kms). December 12th Leave car at Dunedin airport and fly to Auckland, via Christchurch with Ansett New Zealand (went into liquidation in 2001), returning to First Imperial Hotel for one night. Flight time, including short stop in Christchurch, was just under 3 hours. December 13th Fly from Auckland to Fiji for 4 nights at the Sonaisali Island Resort, PO Box 2544, Fiji . Phone 00679-706011. Not much birding, mainly tourist things including a boat trip and a visit to an impressive orchid garden - Garden of the Sleeping Giant - located c6 kms north of Nadi International Airport. December 17/18th Flight from Fiji to London via LAX and onwards to Manchester. A great holiday, but we were pleased to be going home. Birds were seen in the main at the sites outlined. However on occasions, birds may have been seen at stops in appropriate habitats on the journeys to and from the sites. Whangaparaoa (23/11) Sandy bays with some small marshy areas, overlooked by wooded hillsides. Little Black Cormorant (Shag), Grey (Pacific Black) Duck and Sacred (New Zealand) Kingfisher were noteworthy, whilst Common Peafowl, New Zealand Dotterel and Eastern Rosella were only seen at this site. Auckland (23 & 24/11) Not many birds seen in and around the city, however Common Myna was only seen at one other site and the only Barbary Dove (African Collared-Dove) of the trip were seen here. Sadly we did not have the time in our schedule to arrange a boat trip to Tiritiri Matangi Island as the ferry service did not run daily. Current details can be found on the Gulf Harbour Ferries web site. Miranda (24/11) In the Firth of Thames with the reputation of being the best and most famous shorebird locality in New Zealand , the Miranda Wildlife Reserve did not disappoint. Common Pheasant, Wrybill, Knot, Red-necked Stint, Little Tern and "feral" Rock Dove were only seen here with Turnstone only seen at one other site. Muriwai Beach (25/11) Famous for its Australian Gannet and White-fronted Tern breeding colonies and well worth the trip, with some amazing close-ups of both species. Mokoia Island (26/11) Regular boat trips go to the Island where there are some spectacular tree ferns. Our only Stitchbird and Saddleback were seen here, with several pairs having been introduced from Hauraki Gulf in August 1994. We saw our only Grey Warblers of North Island here and at the nearby Pureora Forest. Lake Taupo (26 to 28/11) Our only New Zealand Grebe (Dabchick) and Shining Bronze-Cuckoo were seen around the lake with Little Black Cormorant (Shag), Feral Goose, California Quail and Australian Coot only seen at one other site. There were numerous waterfowl on the lake. Pureora Forest Park (27/11) Ancient podocarp forest where we saw our only Yellow-crowned Parakeet, Long-tailed Koel (Cuckoo), Whitehead and Fernbird. We also had good views of California Quail and Tomtit, but didn’t arrive early enough in the day for the reserve’s most sought after bird, the Kokako. Tongariro National Park (28/11) Blue Duck was our main target here on the Manganui a Te Ao River near Orautoha. After quite a lengthy search we eventually located a pair making the substantial detour well worthwhile. Lower Hutt (28/11) A staging post to South Island, only noteworthy for the first and only Canada Geese on North Island. Cook Strait (29/11) The 3 hour ferry crossing on The Interislander between Wellington Harbour and Queen Charlotte Sound is one of the best opportunities for sea watching in New Zealand and we weren’t disappointed. We had our only views of Buller's Albatross (Mollymawk), Flesh-footed Shearwater and Common Diving Petrel on the crossing, as well as Little (Blue) Penguin which was only seen elsewhere on Stewart Island. We also saw Shy Albatross (Mollymawk), Northern Giant Petrel, Fluttering Shearwater and Hutton’s Shearwater, which were only seen at Kaikoura in addition. Nelson (29/11) Covering the area around Tasman Bay with many marshes and mudflats. Only briefly visited but yielding our only sighting of Wild Turkey and Grey Teal, seen also only at Kaikoura. Kaikoura (30/11 & 1/12) Famous for whale watching, with Sperm Whales the main attraction, Kaikoura is also an outstanding seabird site. We had our only sightings of Wandering Albatross, Cape Pigeon and Westland Petrel in addition to the four species mentioned above under Cook Strait. We also saw Grey Teal, Western Reef Egret and Banded Dotterel which were only seen at one other site. The scenery at Kaikoura is stunning and well worth the visit to this area in itself, without the other obvious added attractions. With hindsight, we should have arranged a seabird pelagic with Ocean Wings Albatross Encounters, as well as the whale watching with Whale Watch. Lewis Pass (2/12) One of only two ways to get from east to west coast in this area along with Arthur’s Pass. We did not see many birds on this long journey as stops were restricted by time. We did however see our only Rook of the trip here. Greymouth (3/12) Nothing special in this overnight stop other than our only Great White Egret (White Heron) of the trip. Fox Glacier (3/12) Stunning scenery. Our target bird, Kea, was waiting in the car park scavenging and attacking vehicles as usual. Lake Moeraki (4/12) Unfortunately we were just too late for the Fiordland Crested Penguins at Monroe’s Beach, a 2km walk from the Lake Moeraki Wilderness Lodge. In typical fashion for this site we heard, but did not see our only Morepork of the trip, but we did manage our first Brown Creeper which was only seen on Ulva Island afterwards. Haast Pass (4/12) Journey via Pass to Lake Ohau with much stunning scenery on the way. We saw only our second Banded Dotterel (and many more besides in the wide stony river beds) together with good numbers of Black-fronted Tern. Lake Benmore (5/12) Our onward journey to Queenstown took a slight detour North near the Lake Ohau Power Station for the chance to see Black Stilt. We saw many White-headed Stilt in our two hour stay and were just about to give up when our patience was rewarded and one of our targets flew past us and landed on the lake shore nearby, giving stunning views. We also had our second only sightings of Australian Coot. Queenstown (6/12) Nothing special on the bird front in the Bungee Jumping capital of the world, which was really only an overnight stop on the way to Te Anau and Milford Sound. Lake Gunn (6/12) On the way from Te Anau to the Sound, we had our only sighting of Rifleman. Te Anau (7/12) Spent some time with a very friendly New Zealand Robin on the return from our 3 hour cruise down Milford Sound with Red Boat Cruises. Birds were far and few between as the weather took control of our day, starting with beautiful sunshine for the first half of the journey followed by torrential rain which continued throughout the boat ride and turned into snow as we came back out of the Homer Tunnel on the return journey and then swiftly into torrential rain again. The waterfalls in Milford Sound were however quite spectacular! Bluff (8 & 10/12) Stopping point for the ferry service to Stewart Island. "The ferry" is two 20 metre catamarans capable of speeds nearing 30 knots and despite quite choppy water the trip was comfortable. One or two good birds on the way but nothing we hadn’t seen elsewhere. Stewart Island (8 & 9/12) Probably the best food of our whole trip at the Stewart Island Lodge. The meals were really excellent and different. We saw Bronze (Stewart Island) Shag, Pacific Reef Egret and Grey Warbler which were not very common elsewhere and had New Zealand Kaka, Bellbird and Tui to entertain us around the hotel. We tried to book an evening Kiwi walk when we arrived, only to find all the available trips were booked up. Isn't hindsight wonderful! 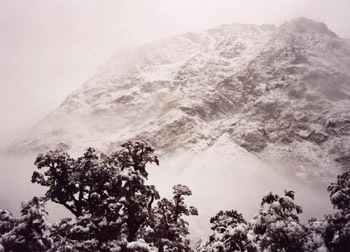 Contact Kiwi Wilderness Walks for information and bookings. Ulva Island (9/12) A further short boat ride south from Stewart Island. Along with the Kaka and Red-fronted Parakeet only seen on S I, we saw our second only Little (Blue) Penguin plus Brown Creeper and the only Weka of the trip (9 adults and 2 juveniles, with one very friendly individual taking pumpkin seeds from Amanda’s hand as we stepped off the boat). Papanui Inlet (10/12) Returning from Bluff to Dunedin we visited this area of the coast and saw numerous cormorants, shags and herons on the vast areas of exposed sand and mud at low tide. We also had our first sighting of Royal Spoonbill. Taiaroa Head (11/12) The visit to the Northern Royal Albatross breeding colony was an incredible experience with these magnificent birds flying only a few feet above our heads. We also saw hundreds of Yellow-eyed Penguin (our only sighting) at their nearby breeding colony. We had our second sighting of Royal Spoonbill together with numerous other “lifers” already added to our list since 23rd November. Dunedin (12/12) Taiaroa Head apart, we found birding around the city uneventful. The following morning we returned to Auckland for our final night in New Zealand before moving on to Fiji. Fiji (13 to 17/12) Our aim was to chill out after our thrash around New Zealand and although we didn’t seek out birds, we managed to see 15 lifers in a total of 21 species, mainly around our hotel on the south coast of Viti Levu. Birds included Peale's Imperial Pigeon, Fiji Parrotfinch, White-rumped Swiftlet, Fiji Shrikebill, Vanikoro Flycatcher, Polynesian Triller, Pacific Swallow, Fiji Woodswallow, Pacific Reef Egret, Red-vented Bulbul, Jungle Myna and Pacific Golden Plover. We left Fiji at almost midnight on 17th December, very pleased to be going home, via LAX, where we managed a further lifer from the airport windows (California Gull) and London. We arrived back in Manchester at 12.40 on 18th December, tired & weary but happy, with a wonderful trip behind us.